This year there are four hot trends in holiday crafts. They are Colorful/Rainbow, Glam, Farmhouse, and White Christmas. No matter which of the trends you pick, you will have a festive Christmas Season. We are giving away one project from each of our 4 trends. The pieces are Colorful Advent Calendar, Farm House Happy Holidays, Glam Stocking and White Christmas banner. To enter go to the Plaid Facebook page every Wednesday and like the post. A random winner will be picked. See the official rules below. Have a very festive holiday season!! 1. Promotion Description: The Holiday Giveaway ("Sweepstakes") begins on 11/14/2018 at 12:00 AM (Eastern Time (US & Canada)) and ends on 12/12/2018 at 11:59 PM (Eastern Time (US & Canada)) (the "Promotion Period"). By participating in the Sweepstakes, each entrant unconditionally accepts and agrees to comply with and abide by these Official Rules and the decisions of Plaid Enterprises ("Sponsor"), which shall be final and binding in all respects. Sponsor is responsible for the collection, submission or processing of Entries and the overall administration of the giveaway. Entrants should look solely to Sponsor with any questions, comments or problems related to the Sweepstakes. 5. Online Entry: You must like the post on Facebook posted each Wednesday starting Nov 14. Dates of posts will be: Nov 14, Nov 21, Nov 28, and December 5th. 8. 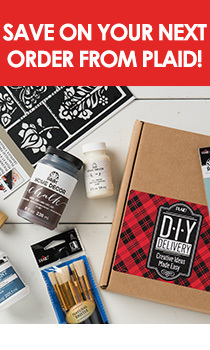 Winner's List: To obtain a copy of any legally required winners list or a copy of the Official Rules, send the applicable request and a self-addresses, stamped, #10 envelope to Plaid Enterprises cc: Martha Stewart Paint Giveaway at PO Box 7600, Norcross, GA 30091. Request must be received no later than 48 hours + 6 MONTHS for the name of the winner and, by the end of the promotion, for a copy of the rules.